I'll admit that I'm a homebody pretty much year round, but during the fall and winter months, I enjoy staying home even more. There's just something so cozy about your own space. 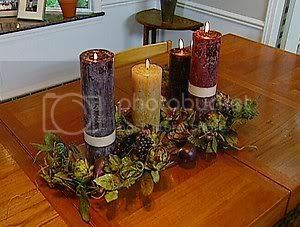 Of course this time of year it's nice to add a few touches to your home to celebrate the holidays as well. Where do you find ideas for decorating? 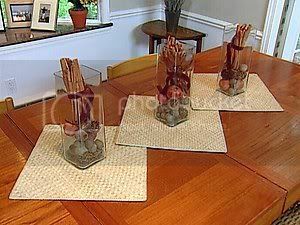 Well you can look on Martha Stewart or HGTV for ideas like these centerpieces. Or you can do my personal favorite and blog hop! I found this idea on Daisy Cottage and Cherry Hill Cottage recently. Unfortunately I found the idea too late to use it for Halloween so I altered it a bit to last through Thanksgiving. 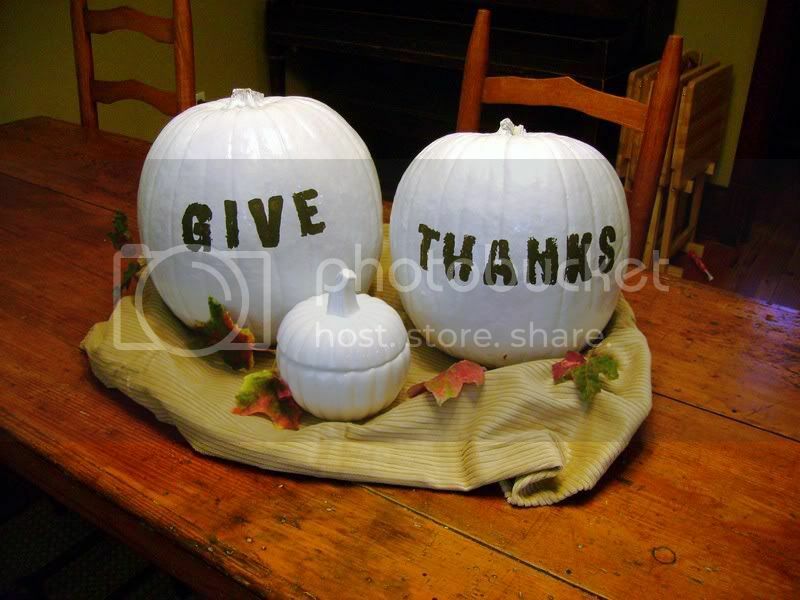 I didn't have the stick on letters, but I did have some foam stamps so I used those to spell out Give Thanks. Next time I'm thinking I'll use the sticky letters though as they just look nicer. I intentionally left my stems white because I had the white ceramic pumpkin jar I wanted to match. So it's as easy as a can of white spray paint! Okay, now speaking of homes but on a slightly different note - I haven't reported much lately on my thrifting treasures, but I wanted to share this one. The Man snagged this secretary for just $30 at an auction the other day! I really like it, but I think I'll switch out the hardware to something black and maybe a bit more masculine looking to tone down the frilly-ness of it. And we have the perfect spot for it. The catch is I have nothing to put inside of it! It has 3 glass shelves. Suggestions? Holy cow! He got that for $30??? I am sooooooo envious! I could fill that sucker to the brim with depression glass or anykind of good old stuff! $30 is a definite steal! Wow, that's pretty cool! I am constantly looking for storage solutions over at my house...! I would fill it up with my sewing overflow...notions, and such. I would paint it too...gasp! I love painted wood, although I know not everybody does. Almost all the wood I have in my house is painted...hence, the painting suggestion, LOL! I LOVE it though, it is a FAB find. Where are you looking to put it? The colored glass would look great, especially if you can rig a light in there. You could also fill it with fabric covered boxes and beautiful paper, pen holders file holders, for the ulimate secretary. Great find!